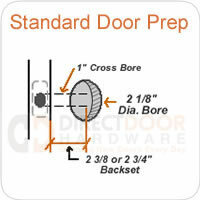 Don-Jo Deadbolt Bore Wrap Around Door Reinforcer. Not always stocked - Please allow 2 weeks before shipping. The Don-Jo wrap around or door reinforcer is designed to be used on common door thicknesses indicated below (must specify when ordering) and is a great piece of hardware to provide some extra security and door reinforcement. These are also commonly used to reinforce doors that have been damaged to doors due to forced entry. Available for use on 1 3/4" Thick or 1 3/8" Thick Doors (must specify). Available with 2 3/8" backset or 2 3/4" backset (must specify). 4 1/4" x 4 1/2"
These were very easy to install. I used them to conceal damage I did to my outside doors when I replaced the door handles (my first attempt at chiseling to fit the face plates). I didn't have it in the budget to replace doors just yet and this actually looks very nice. I purchased in Bronze color and matched my new handles. It also added some reinforcement to my doors.